As interest increases throughout the world in the investing and collecting of banknotes, segments of the banknote market ebb and flow in their popularity. Over the last 10 years in Australia for example we seen interest increase in Pre Federation Banknotes, Pre Decimal Star* Banknote Replacements then on to Decimal Star* Banknote Replacements, the level of interest in a segment of the numismatics market can last for any number of years, with this interest comes the natural progression of supply and demand, which in turn leads to an increase in base selling price with average annual capital returns of 15%(approximation only) being experienced from 2000 to 2010. From 2008 collector interest has turned to the more unusual aspects of the banknote market which include SOLID & RADAR NUMBERS, ERROR BANKNOTES IN ADDITION TO FIRST AND LAST PREFIX BANKNOTES. Are banknotes that have a solid sequence of serial numbers EG: 444 444. 666 666. 888.888. 333.333. if solid numbered banknotes incorporate a First Prefix numbered banknote of AA99 444 444 the banknote will increase in value from the base Recommended Retail price for a solid numbered banknote to 2-3 times this value. Solid numbered banknotes hold interest to collectors for various reasons. In some cultures solid numbers if in the correct sequence will indicate good luck eg: 888 888. 111 111. 666 666. Collectors will seek out solid numbered banknotes to complete a series if at all possible in a denomination of $5, $10, $20, $50, $100 commencing with 111 111 leading through to 999 999, the “holy grail” would be to secure the numbers 000 000. Such an undertaking may take a lifetime, if achievable at all; part of the enjoyment of any collector is in the journey not the destination. The mathematical possibility of collecting certain desired solid numbers as listed above could not be calculated, to achieve such a collectors dream would come down solely to luck and circumstance. To secure solid numbered banknotes within a reasonable financial budget now focuses on Polymer banknotes, these banknotes are available in excellent grades normally they can be purchased in the grade of Uncirculated. Prices for solid numbered banknotes are driven solely by market demand, there are no fixed guidelines a purchaser can follow when purchasing these banknotes. At the present time it is a sellers market with demand far exceeding supply. Prices of solid numbered banknotes over the last 3 years have shown an annual capital return of 15%-20 %( approximation only) with this trend set to continue well into the future. Radar numbers are those banknotes that are numeric anagrams; the banknote reads the same backwards as it does forward. EG: $5. AA01 168 861, AA01 942 249. First Prefix and Radar Numbered. JD01 790 097, JD01 671 176. Last Prefix and Radar Numbered. Radar numbered banknotes are highly collectable and affordable at this time, there is a higher possibility of collecting radar notes as opposed to solid numbers, due to the equation of printing runs to complete sequential runs of banknotes up to 999999 within a pre determined prefix range, based on probability radar numbers will exceed solid numbers in the printing process by a well defined high ratio of up to 55:1 in some instances. Prices for Radar banknotes as single banknotes or in runs of up to 5 banknotes will depend on the vendor©s asking price, and your ability to negotiate a price that fit©s into your financial budget. There are no guidelines for the pricing of radar banknotes. Research throughout the internet will assist you in determining a fair price. Error banknotes are those individual banknotes that have a printing fault of some type that makes each banknote unique. Errors can include missing serial numbers, missing printing phases whether this be simultan or intaglio printing, ink faults, additional flaps, mismatched serial numbers or registration shifts. Error banknotes as in investment are proving to be very successful as popularity grows in this are of banknote collecting. Annual capital returns of 10-12% per annum are common place with this return set to rise significantly in the years to come. Error banknotes should never have left the original source of printing, these banknotes were meant to be destroyed by The Reserve Bank, and never released to the general public, for reasons unknown thousands of these error banknotes were put into circulation. It is lost in history as to how these banknotes were never destroyed at the point of printing; however there are differing points of view as to how they made their way into the Australian numismatics market. Paper banknotes have a far higher ratio of release than Polymer banknotes when it comes to error banknotes, and therefore paper banknotes are highly sought after by both investor and collector alike. Grade of the error banknote is critical when purchasing, uncirculated grades are available to the buying public, and if possible this is the grade you should consider when purchasing. Prices for error banknotes are well recorded based on grade, type of error, and availability. A dealer can advice you on pricing when you purchase error banknotes. There are collectors who focus on only on the purchase and sale of error banknotes, the market is growing every year to a point where average annual capital returns range between 5%-7.5%. The most popular types of banknotes with collectors are no serial numbers, mismatched serial numbers, no intaglio or simultan printing followed by registration shifts, wet ink transfers, and creases & folding. An expected price range for a good quality error banknote can vary from $2500.00. to $100.00. A collector should be aware of the bargains to be had in this segment of the market if you look around for a particular purchase. Error banknote are plentiful and price is always negotiable. 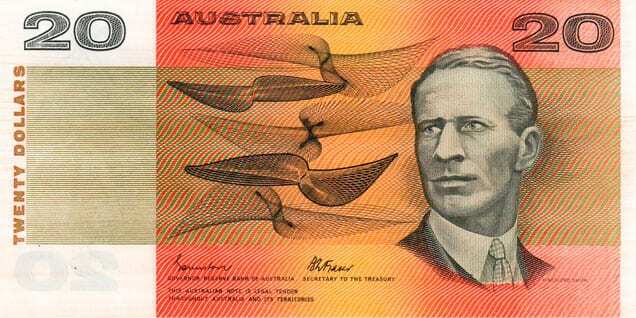 First and last prefix banknotes have been in circulation since the creation of Australian paper banknotes in the early 20th century. First and last prefix banknotes denote when the first and last banknote were issued, we can tell from these prefixes together with the signature combinations exactly when the banknote was released and in turn when the banknote was discontinued. As so few first and last prefixes were printed prior to decimalization they are best described as very rare. Pre decimal prefixes up to 1966 are extremely hard to come by, as these banknotes have been destroyed, lost or placed in private collections. When from time to time these banknotes within this years from 1911 to 1966 are offered for sale, if of better than average grade prices can range up to $30.000.00. for an uncirculated banknote. First and Last Prefix banknotes in the Polymer issued banknotes are far more common, prices for early issue banknotes from 1988 to 1999, maintain a high level of interest from the interested investor. Our Bi-Centennial $10.00. which had two issues due to a technical error in the first print run of the banknote has one first prefix of AB10 with two last prefix of AB33 and AB57. Prices for these banknotes in Uncirculated are worth up to $2750.00. for an individual banknote. Polymer banknotes from 1991 to the present time have first and last prefix attachments in each denomination with alpha numeric symbols. Examples are AA denotes a first prefix followed by the year of printing 96.97.98 etc Last Prefix banknotes can commence with GL,JC,JC or JK followed by the year of printing 96.97.98. Banknotes between 1995 to 1999 can be extremely valuable with prices ranging from $3250.00. for a $100. last prefix to $500. for a $50 last prefix. Banknotes from 2000 that have been printed although valuable have a price range from $40 to $250. Polymer banknote collecting is an entire separate area of collectables within the banknote market, the market is growing with every passing year, and an average annual capital return of 5-7.5% can be achieved when collecting polymer banknotes. We hope this article has been helpful to our readers, to assist you when deciding the future direction of your banknote portfolio. Although a lesser known area of collecting these individual segments offer affordability, availability in excellent grades, an excellent capital return on your investment. The Right Note stock a wide and affordable range of these banknotes, inquiries can be directed to us, we will be happy to answer your questions.